Are you interested in booking Kate for a Master class for your organisation? 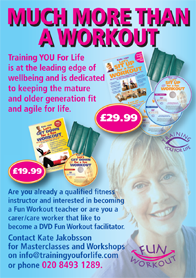 Are you a carer / care worker who like to become a DVD Fun Workout facilitator? Are you already a qualified fitness instructor & interested in becoming a Fun Workout teacher? Contact Kate Jakobsson info@trainingyouforlife.com or call 02084931289 for more information.